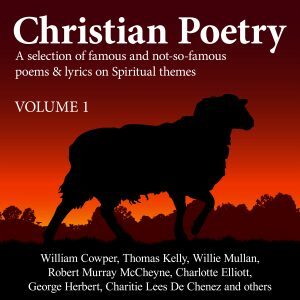 62 poems by various authors including William Cowper, Thomas Kelly, Willie Mullan, Robert Murray McCheyne, Charlotte Elliott, George Herbert, Charitie Lees De Chenez and many others. This Volume contains 62 Poems by William Cowper, Thomas Kelly, Willie Mullan, Robert Murray McCheyne, Charlotte Elliott, George Herbert, Charitie Lees De Chenez and many others. 16 I Have Christ, What Want I More? 21 Inscription for the tomb of Mr Hamilton. 26 My Sins, My Saviour! 58 Break Thou the Bread of Life.